[prMac.com] Cincinnati, Ohio - Code by Kevin has released Manpower 1.0, a program that provides a simple, elegant three-pane interface that makes reading man pages on OS X as easy as reading e-mail. Manpower is a Mac OS X graphical user interface to the main system of Unix software documentation, the man page. Man pages are concise but thorough descriptions of the functionality and methods of the various Unix command-line programs; there may be hundreds of such programs installed on a Unix or Linux system. Man pages are typically accessed in the Unix terminal by typing the phrase "man program," with "program" being the specific name of the Unix tool you are trying to learn more about. While accessing the man page system in this manner is efficient, it has limitations. It is difficult to read documentation in the Unix console; the type is usually very small, and can only be read one screen at a time, making scrolling and skimming through the material a tedious process. 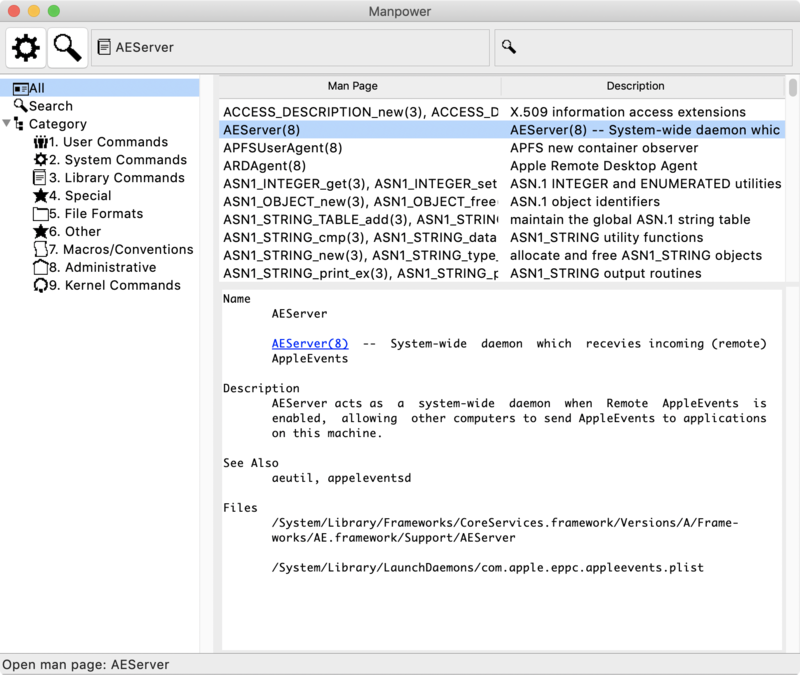 Manpower provides a simple, elegant three-pane interface that makes reading man pages as easy as reading e-mail. * Clean, three-pane interface: Reading man pages is as easy as reading e-mail. * Search, browse, display, and save new man pages in a single window. * Thorough user documentation via the "Help" menu. To install Manpower, download the latest version. It can be installed anywhere on your machine. The download is a 30-day demo; you can purchase a license to use the program past the 30-day trial period. Mac OS X 10.4 is the minimum supported platform. A license for the full version of Manpower is $19.95 USD.